I thought that three months was a heck of a long time to try something, but here it is, already at the end. Dang, that went quickly! 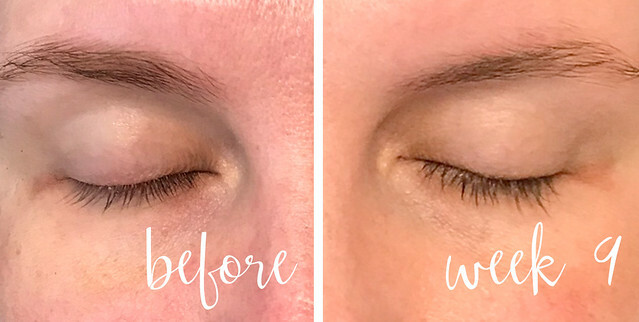 Without further ado, here's my final thoughts and recommendations on using the Rodan + Fields Reverse regimen and Lash Boost serum. week 10 - Really loving my lashes. They've evened out nicely after a bunch of them fell out at week 7. I still occasionally have some dry eye, but it's nothing a few eye drops first thing in the morning can't fix. week 11 - I mentioned at week 5 having to not use the product for a night to help with dryness, but I've been using it consistently every night for the past two weeks and have had zeros issue with dryness or styes. I've really noticed my lashes starting to darken as well as thicken. week 12 - For the first time in years, I feel like you can actually see my eyelashes when I'm not wearing mascara. I've been able to use less product and I love how full, thick and long they're looking. 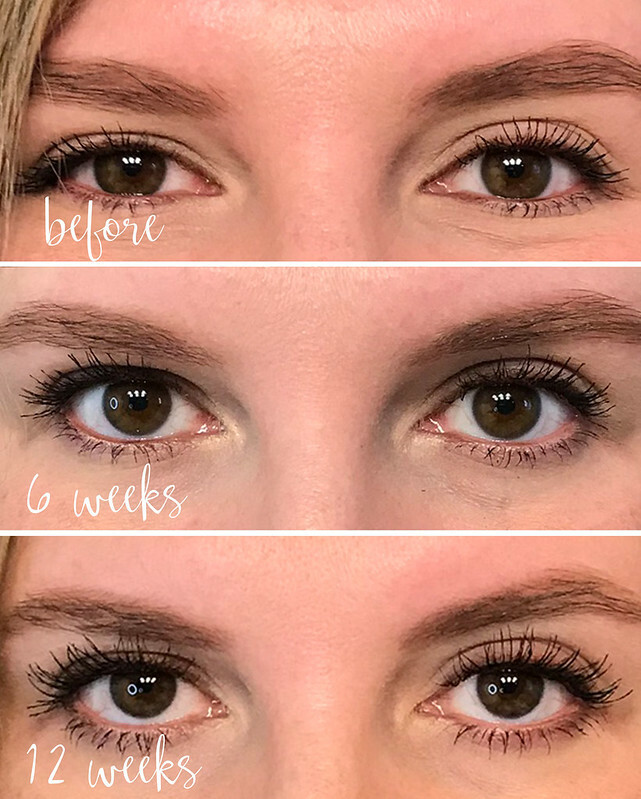 Final Thoughts: While it took awhile to get there, I LOVE LOVE LOVE my lashes! I feel like I finally got the hang of applying so that it doesn't run into my eyes. I'm not having dryness, redness or irritation anymore and I love that I don't have to apply nearly as much mascara. To keep things consistent, for the week 12 photo I stuck with my original routine - eyelash curler, primer and a good thick coat of mascara, but most days I've been skipping the eyelash curler and primer because I don't need them. One swipe of mascara is more than enough. I'm still on the original tube of Lash Boost serum and plan on repurchasing once it eventually runs out. 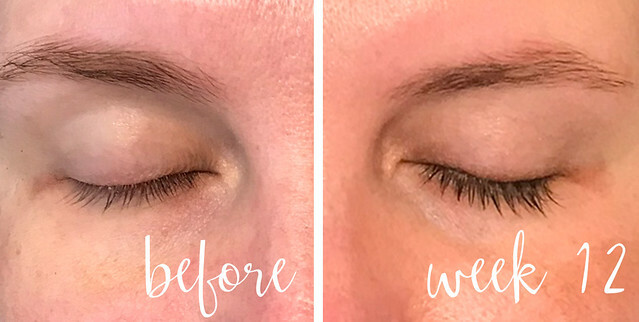 So much cheaper than getting lash extensions! Worth every bit of the initial $150 investment in my opinion. 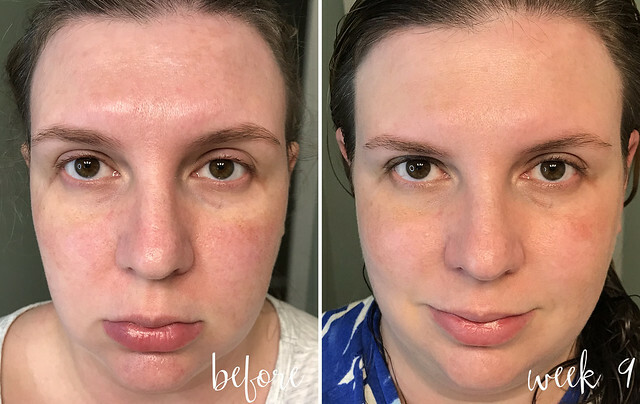 Week 10 - I've just been keeping up with the regimen as normal this week. No major changes. Week 11 - Okay, this week I got a little lazy. I skipped doing the full regimen each night. I washed my face but didn't bother with the toner or the brightening complex for a couple of nights. I've noticed that just skipping a night or two means for a very oily face once you start using it again properly. I've also noticed that the brightening serum tends to make my (already oily) skin extra oily, especially now that it's summer. Week 12 - Majorly oily skin this week + a breakout on the top and sides of my nose. To be fair, I live in Florida, it's crazy hot right now, and I've been sweating. Yuck. So that very well may what's the blame rather than the product itself. On the plus side, I'm still on the original tubes of the brightening complex, though they are just about to run out. I'm pretty pleased that I got a little over three months of use out of them. The face wash and toner are on track to last about two months again this time around. Final Thoughts: I've definitely seen an improvement in the texture of my skin - it's so soft now! 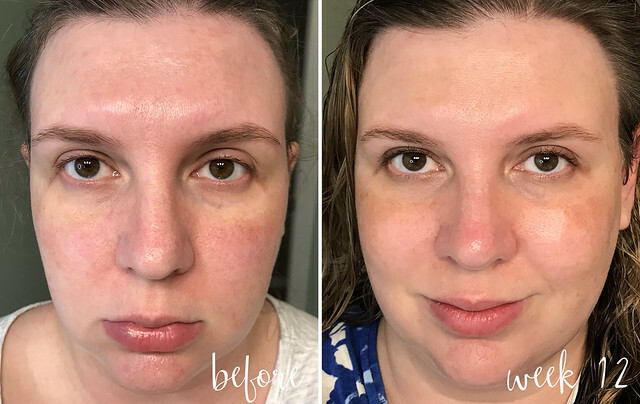 My skin is less dull - and I think - looks healthier overall. I still have dark marks (especially on the tops of my cheeks), and while there's been some improvement in tone, it's not a drastic change. While 12 weeks is a decent amount of time try something, I think this product will take months of continuous use to see a dramatic result. But overall, I've been pretty pleased with it and plan on seeing if a few more months of use will continue to help with the dark marks. Do I recommend? Yes, but don't expect super quick results. Have you tried Rodan + Fields? I'd love to hear about your experience! (If you want to check out the progress throughout the 12 weeks, you can read weeks 7-9 here, 4-6 here and 1-3 here). *This post is not sponsored and all thoughts and opinions are my own. travelling: to Destin last week to play tourist for a day including shopping at the outlets, strolling the beach and sipping on fruity cocktails. grilling: nothing after my husband accidentally set our grill on fire. But if I could grill something, it would be this delicious looking Mexican street corn. Yum. planting: nothing (because I have a black thumb when it comes to gardening) but still wanting to find a way to incorporate some blue hydrangeas to my landscaping. playing: with this little pair of sillies. Sharing with Anne in Residence and co-host Sarah of Total Basset Case for Currently. Each month features a series of prompts that may be interpreted any way you wish. I just discovered Lauren, Emily and Kristin from Bestie Dressed, and I'm obsessed. All three of them have a such a great, obtainable style. Love it! 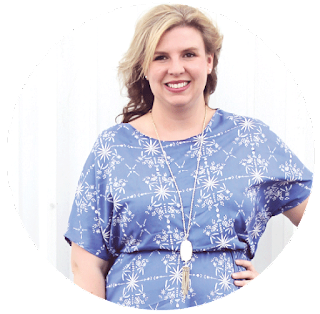 Another recent blogger find is Lauren from Simply Holifield. She's from Chattanooga (shout out to my hometown)! 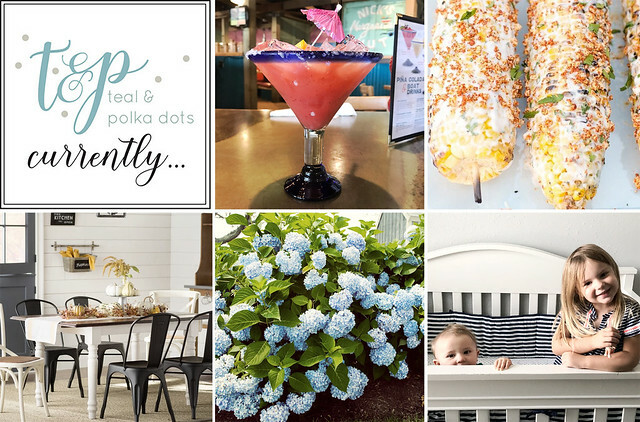 Loved her recent post on her trip to 30A (which is practically my current backyard). 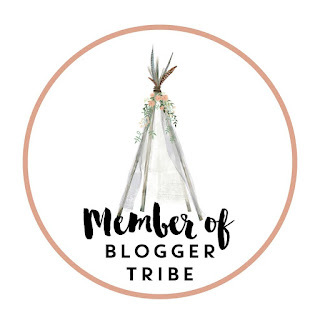 A new(ish) blogger that I love is Keely Raquel. Now in Nashville, I knew her when she lived here in Panama City Beach. She does gorgeous makeup and her outfits and home decor are equally amazing. on the blog: oh, my gosh nothing lately. I'm so, so sorry I've been MIA lately. My camera broke (which I'm beyond upset about) so I haven't been able to take any outfit photos. Plus, I've been crazy busy and wanted to focus on other things. So no blogging lately. 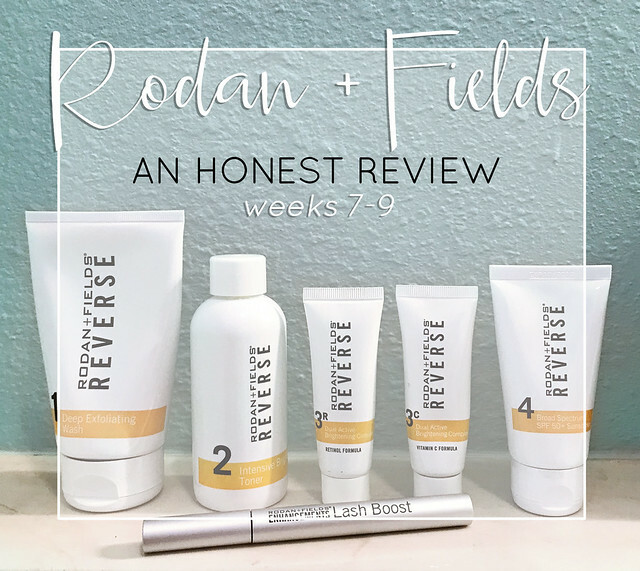 But last week, I posted a review of weeks 7-9 of using Rodan + Fields. on instagram: when I stopped blogging I kinda went dark on the Instagram as well. So my only recent post is the same picture as above...a neutral look with a lace peplum top, crochet cardigan and skinny jeans. coming up on the blog: since my camera is still broken, I don't anticipate being able to take outfit photos (depressing) so I'm not really sure what the week will look like. What would you like to see other than an outfit post? what I'm watching: just finished binge watching Nurse Jackie. what I'm crushing on: Lisi Lerch earrings. My favs styles are ginger (in the latte color), button (in pearl) and maya in czech pink. what I'm looking forward to: Aubrey's birthday on Thursday - can't believe my baby is going to be 4-years-old - and her unicorn themed birthday on Saturday! Week 8 - I'm not going to lie, I'm so unhappy with my the way my lashes look. After last week's fallout, the remaining lashes are long, but look weird, with gaps between the lashes. The left eye definitely looks worse than the right. I'm tempted to stop using, but want to press on until week 12 to see if there's improvement. Week 9 - my lashes are starting to even out - thank goodness - and I've noticed my lashes darkening. At night I keep trying to scrub off my remaining mascara only to realize that's just my lashes, no mascara remaining. My left lashes are still a little wonky looking, but much improved from week 7. 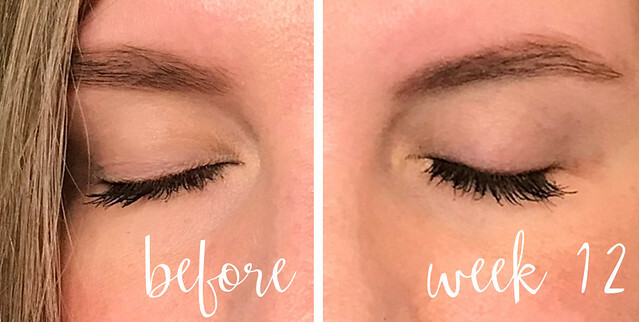 Looking back at week 1 vs. now, I can really, really see a difference in the length in my lashes and I'm hoping my lashes will thicken up in the weeks to come. I'm hoping for volume as well as length. Thoughts so far: I'm still not convinced this is going to be the miracle product that gives me the amazing lashes of my dreams. 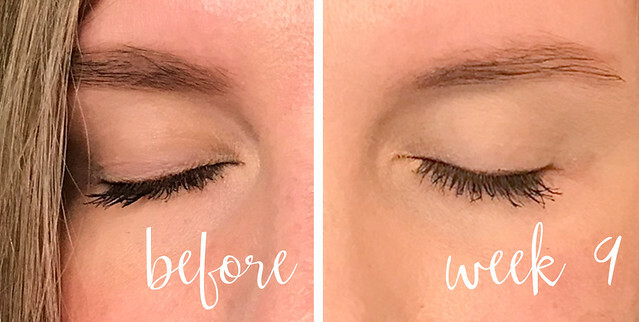 Yes, my lashes are longer, yes they are a bit darker, but with the weird lash fallout and continued occasional eye irritation, it's not a perfect product - at least not for me. That being said, the tube of Lash Boost has lasted a long time. I'm still on the original and there seems to be a lot of product left, which makes me feel a better about the $150 price tag. Week 7 - Ugh, I ran out of toner this week. Still using the cleanser and brightening complex. No huge skin changes of note. Week 8 - This week I ran out of face wash. No real difference in my skin, probably because I haven't been using as much product to try to make it last until the new product arrives (automatic renewal ships every 60 days). Week 9 - Hooray for being fully stocked again with cleanser and toner! Also, I'm noticing a decrease in breakouts, which is awesome! After two weeks of not being able to use perform the regimen as I was supposed to, I'm back to the original routine. It's worth noting that while I did run out of face wash and toner, I have a ton of the brightening complex left. I'm still using the originals and haven't tapped into the new tubes yet. I probably used too much of the toner and cleanser to start out with, so I'm using less of it during each application to see if I can make it last as long as it's supposed to. Thoughts so far: I've definitely noticed an improvement in skin texture from when I originally started using the product and my breakouts are finally starting to clear up. On a daily basis, I don't feel like I've seem dramatic results in reduction of discoloration, but looking at photos, I can see a huge different between week 1 and 9. I've also haven't had to use as much makeup on my skin, which is awesome. Have you tried Rodan + Fields? I'd love to hear about your experience! You can read my review from weeks 1-3 here and weeks 4-6 here. Stay posted for my final 10-12 week review. Loved reading what everyone is up to Currently. Not sure what to buy your momma? Kendi has you covered with her Mother's Day Gift Guide. on the blog: all about all things blush. on instagram: a pretty lilac cardigan and comfy peplum tee. on pinterest: pretty sure I need to make this for my craft room/office/guest room. How pretty is this white paisley jacquard keyhole blouse? Great with jeans, shorts or dress pants. From the sale section, the cutest cornflower blue peacock print shorts. I think this cream button-front bubble-sleeve top paired with this light blue scallop-hem linen-blend shorts, cozy cream open-front pointelle stripe sweater and these blush sueded bow-tie espadrille wedges would make the cutest summer outfit. what I'm reading: Luckiest Girl Alive by Jessica Knoll. what I'm looking forward to: My poor husband is in the middle of a 12 day work week on the heels of a six day work week (with a Sunday off). So basically he'll have worked 19 out of 20 days in a row. We're both so ready for him to have next weekend off! 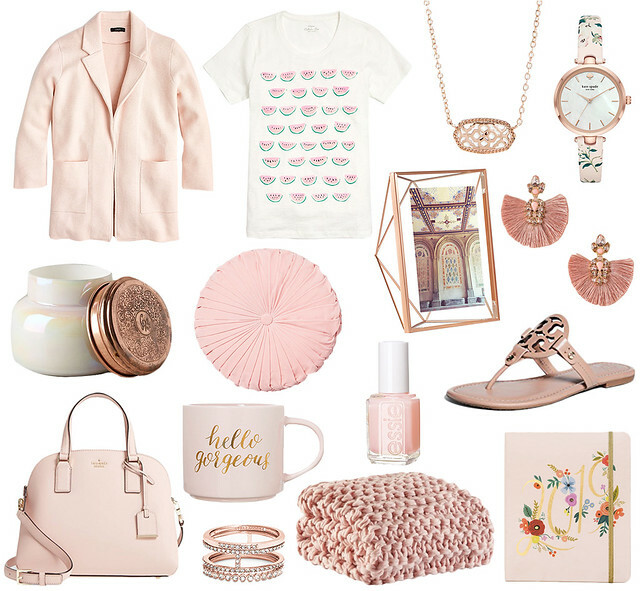 I can say with certainty that my new favorite hue for spring/summer is blush. It's such a happy, fun hue! It's practically a neutral, easily pairing with teals, grays, navys, olives, and even deeper pinks and corals. 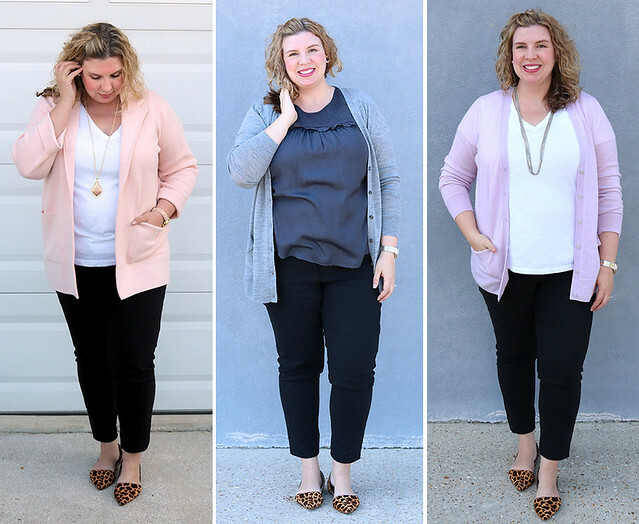 I doubt any of you are surprised that this sweater blazer made the list (see how I've worn it here and here). It's been my go-to layering piece this spring - I'm beyond obsessed with the color and cozy fit. I've yet to wear this combo in real-life, but I think it would look fabulous paired with this watermelon tee and a pair of skinny jeans. This delicate filigree necklace has been on my wishlist for a while now. I tend to gravitate toward longer necklaces, but it would be nice to have a shorter one like this to wear with tees and such. Capri Blue's volcano scent is one of my absolute FAVORITES and I'm beyond obsessed with this gorgeous opalescent container. So pretty. Speaking of pretty things, how lovely would this round toss pillow look on the sofa along with this chunky knit throw? And I could never justify buying them for myself, but I can't say I'd be upset if someone just happened to gift me these Tory Burch sandals. How do you feel about the color blush? Love it or ready for the trend to pass? 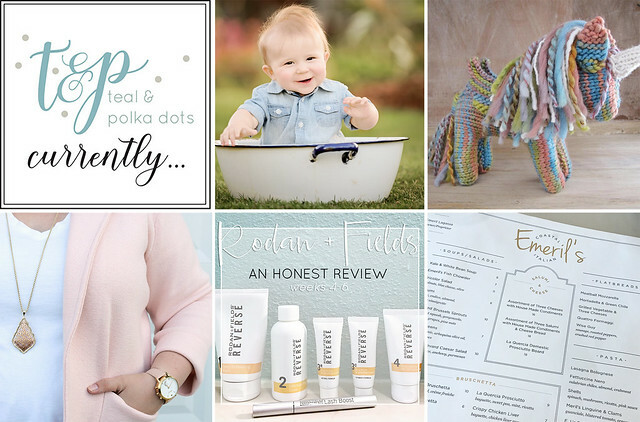 celebrating: little man turning 6 months old! Can't believe how quickly time has passed. He's army crawling and *this* close to full-on crawling, loves tummy tickles, blowing raspberries and is all kinds of enamored with his big sister. creating: this unbelievably adorable knit pegasus unicorn for my daughter. You can purchase the pattern here and I bought rainbow variegated yarn from yarn.com. As soon as it arrives it's knitting game on. wearing: this blush sweater blazer on repeat. 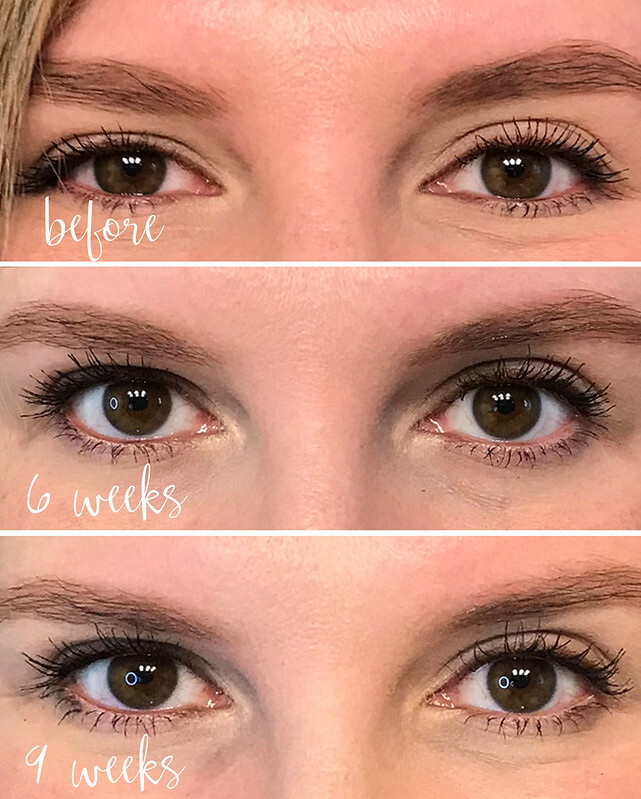 sharing: my experience with Rodan + Fields' Lash Boost and Reverse Regimen. going: (or just went) to Destin to Emeril Lagasse's newest restaurant Emeril's Coastal Italian. He was working in the kitchen that night, so we got to see him in action! Sharing with Anne in Residence and co-host Carrie of A Stylish Fit for Currently. Each month features a series of prompts that may be interpreted any way you wish.